Dismal Swamp Canal, believed to be the oldest existing excavated waterway in America, runs generally north and south for 22 miles between Deep Creek, Va., and South Mills, N.C. The canal connects the Elizabeth and Pasquotank Rivers, thereby affording water communication between the Chesapeake Bay and the Albemarle Sound. Proposed as early as about 1730 by William Byrd II, the idea of such a waterway found late-eighteenth-century champions in Hugh Williamson of North Carolina and Virginians Patrick Henry, Thomas Jefferson, and George Washington. Although both states had approved the canal by 1790, work did not begin until 1793; workers dug from both ends toward the middle, and the two ditches were finally connected in 1805. When completed, however, the canal was "little more than a muddy ditch," according to historian A. C. Brown. After years of shingle flats, the first real ship (a 20-ton craft bearing bacon and brandy from the Roanoke River to Norfolk) finally made passage through the Dismal Swamp Canal in June 1814. Railroads gave the canal competition in the 1840s and 1850s, and by 1859 a new thoroughfare to the east, the Albemarle and Chesapeake Canal connecting the Elizabeth River with the Currituck Sound, began to steal water traffic away from the Dismal Swamp Canal. The Civil War nearly ruined the canal, which could not service its debt in the 1870s and which by the early 1890s could no longer float a boat of three-foot draft. 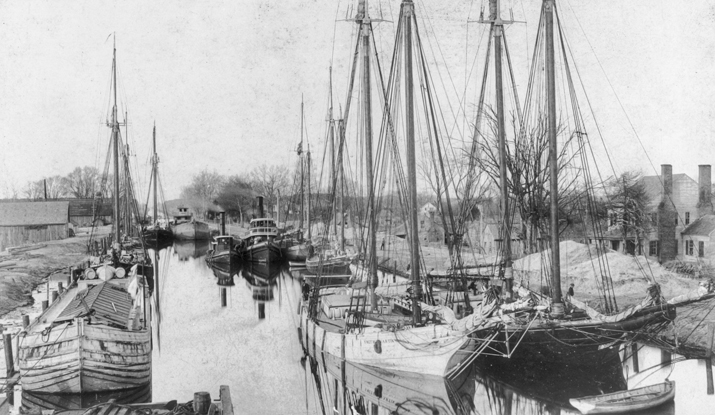 A major reconstruction took place between 1896 and 1899, and for a time the canal carried more freight than the rival Albemarle and Chesapeake. The federal government subsequently bought the Albemarle and Chesapeake and abolished tolls on it, adversely affecting the renovated Dismal Swamp Canal, which also fell to federal purchase in 1929. Useful strategically during the Atlantic Coast submarine threat of World War II, the canal has since shifted its service as a shipping lane from commercial vessels to pleasure craft. Since the 1950s, there have been efforts by the Army Corps of Engineers to close it altogether. 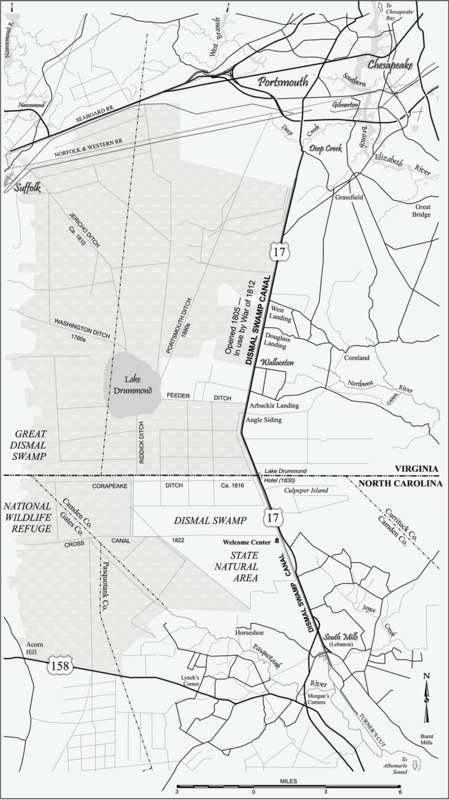 The history of the Dismal Swamp Canal and the road that parallels it is rich and vivid, particularly because of Camden County's nineteenth-century reputation as a Gretna Green and the swamp's history as a haven for runaway slaves and outlaws. One famous canal bank structure, the Lake Drummond Hotel (or "Half-way House," as it was notoriously known), straddled the Virginia-North Carolina boundary and advertised itself in the 1830s as being "in a superior degree, calculated to render facilities for matrimonial and duelistical engagements." In 1829 President Andrew Jackson ate Virginia ham off a cypress shingle along the canal, and in 1894 poet Robert Frost traversed the canal by foot and boat on his unfulfilled suicide trip to the Great Dismal Swamp. The James Adams Floating Theatre, a warm-weather showboat that once toured the Chesapeake and the Albemarle and lay up winters in Elizabeth City, hit snags and sank in Turner's Cut (just below the South Mills locks) in November 1929; it suffered the same fate at another point in the canal in 1937. In 1940 editor W. O. Saunders drove off the canal bank highway, U.S. 17, to his death in the canal. For most of its course in Virginia, the Dismal Swamp Canal forms the eastern boundary of the Great Dismal Swamp National Wildlife Refuge. In North Carolina, it constitutes the eastern boundary of a 14,000-acre Dismal Swamp park. The North Carolina Welcome Center just south of the Virginia-North Carolina line, situated in the narrow strip between U.S. 17 and the canal, is said to be the only center of its kind in America accessible by both motor vehicle and boat. Edmund Berkeley and Dorothy Berkeley, "Man and the Great Dismal," Virginia Journal of Science 27 (Fall 1976). Alexander Crosby Brown, The Dismal Swamp Canal (1970). Jesse F. Pugh and Frank T. Williams, The Hotel in the Great Dismal Swamp (1964). Bland Simpson, The Great Dismal: A Carolinian's Swamp Memoir (1990). Walbert, David. "The Dismal Swamp Canal" North Carolina in the New Nation. http://www.learnnc.org/lp/editions/nchist-newnation/4462. Parker, Ely S. Report on the Dismal Swamp Canal, it cost, condition, and resources. Washington, 1867. http://archive.org/details/reportondismalsw00parkiala. Dismal Swamp Canal. Map by Mark Anderson Moore, courtesy North Carolina Office of Archives and History, Raleigh. A view of the Dismal Swamp Canal at South Mills, ca. 1900. North Carolina Collection, University of North Carolina at Chapel Hill Library.